Done working on a particular account? You can easily remove yourself. 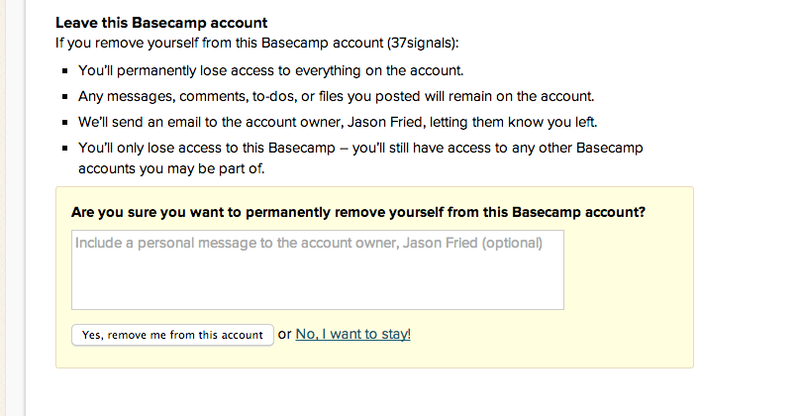 Head to your Me page, and click "My Basecamp Settings". The option to leave an account is at the bottom. Sorry, you can't remove yourself from individual projects! An admin on the project will need to do that for you. Just use the link in your invitation email. The account owner will get a message saying that you declined the invitation. If you're already a member of a particular account, you can't decline invitations to new projects on that account.